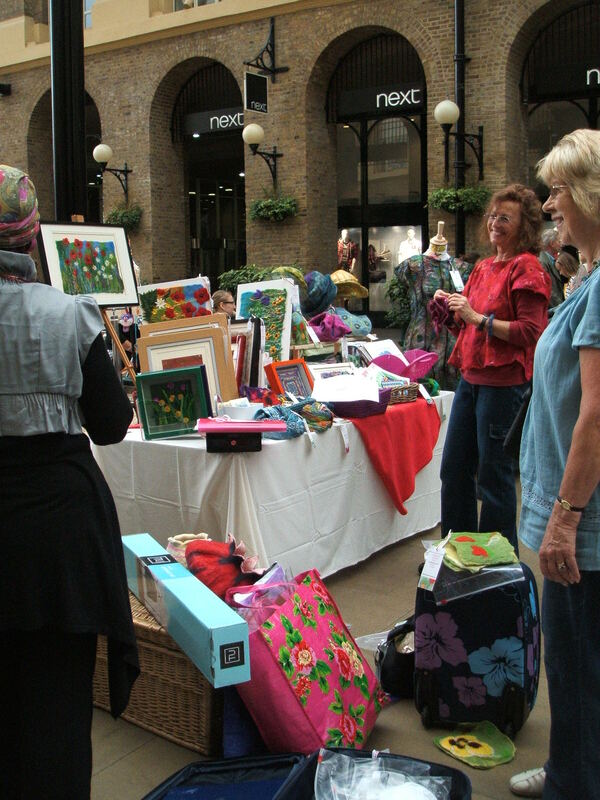 It was good to see so many genuirne craftspeople and artists taking part under the auspices of Southwark Arts Forum. We were able to spread the word about felt, and promote the classes at Morley where most of us met. Thanks also to the person who sold me a cut price apple and cinnamon cupcake as a fellow stall holder!! And especially thanks to Chris who did the majority of the organising and made beautiful personalised designer labels for us all…. 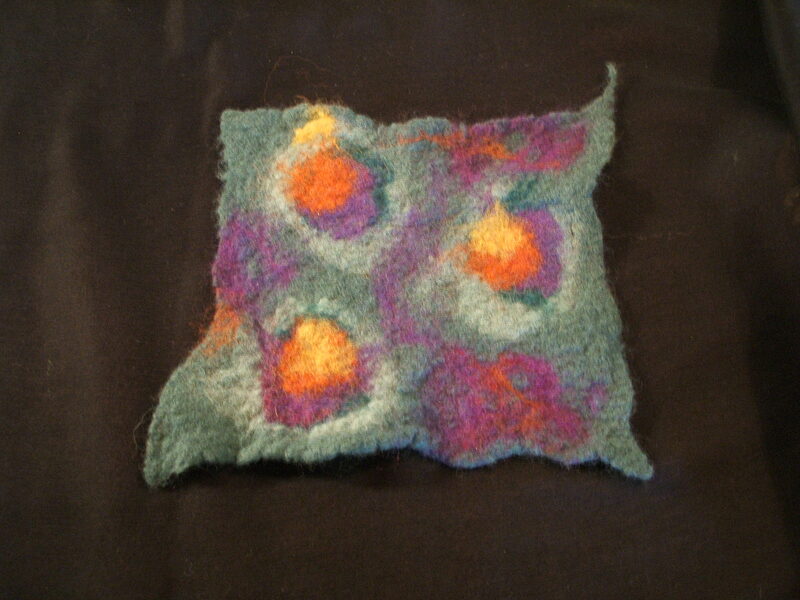 You may have noticed that there have not been many felting posts recently….or many posts at all! I went back into full time work last week after 8 months not in paid work (mostly by choice although I hadn’t intended the break to last quite so long!!). And I spent the last two or three months filling in application forms etc for quite a lot of the time – it takes a remarkable amount of time and energy…. 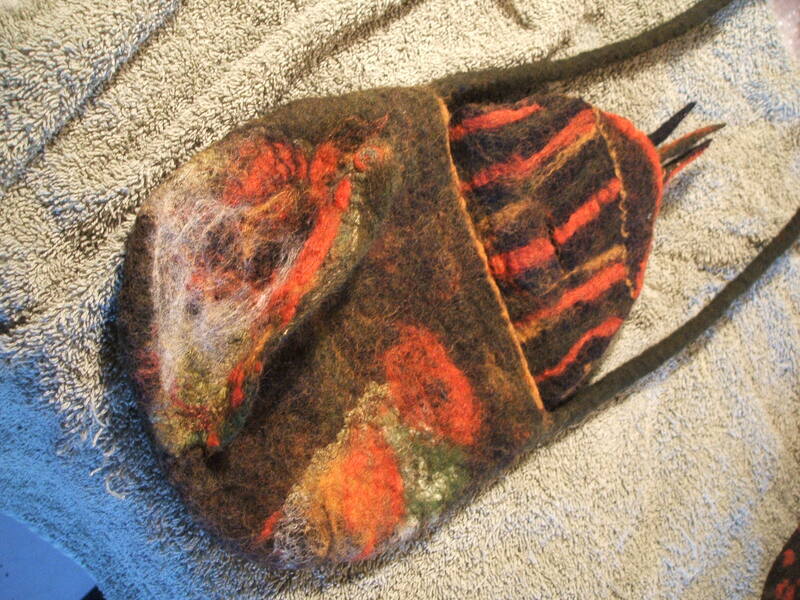 The bag is quite a complicated design with integral flaps and spikes to match the hat. It also has a felt button and a stripey inside. Basically just for fun I threw lots of different techniques at it!! Unfortunately I forgot that the flap on the main body of the bag was due to fold back once it was finished so I decorated the wrong side. But I do like it – I think it has quite a sporan like appearance…. Oh and its going to be a busy week this week. 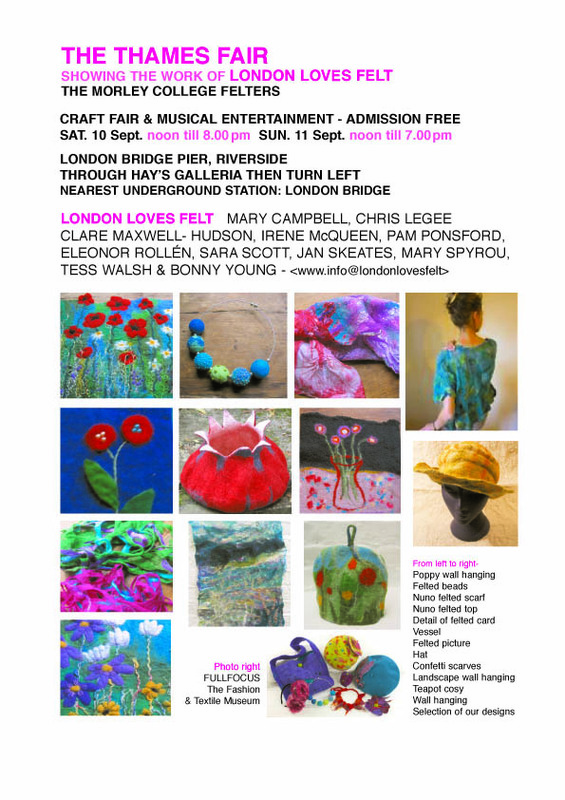 I’m preparing for a stall at Hays Galleria with the felting collective ‘London Loves Felt’ (of which more later). And I have a play to see on Tuesday, I’m acting as auditions’ secretary for the Scotsman and my friend Barrie on Wednesday (of which also more later) and four nights of concert going at the Kings Place Festival Thursday to Sunday…..
Hello to anyone who came to the stall yesterday at Lauderdale House…..We went for a stall inside the house this time and given the weather yesterday I was really glad that we did!! 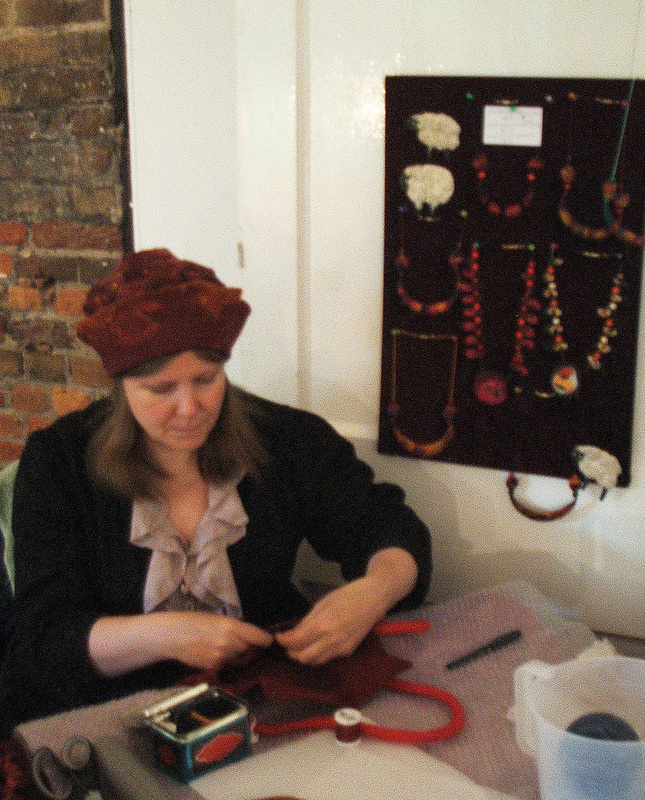 The feltmaking demonstration creates lots of interest. 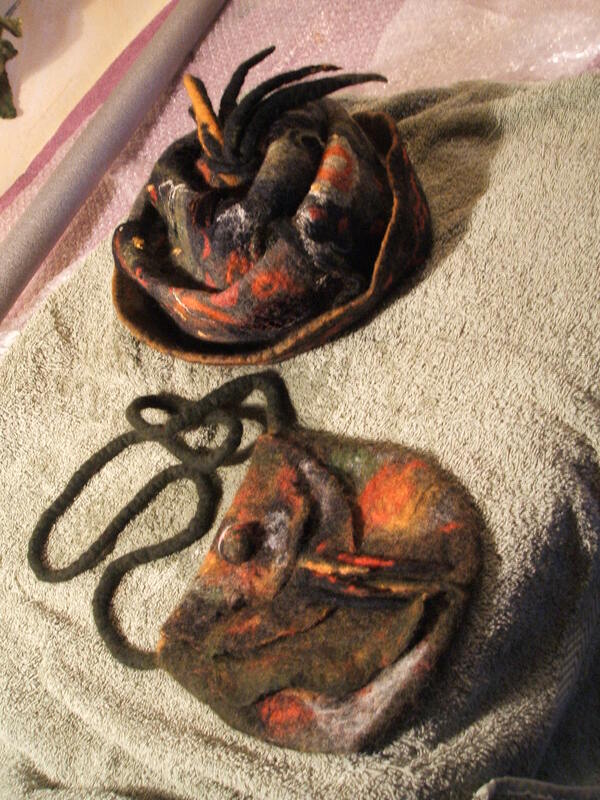 However I am left with a number of small bags and sample pieces which are often attractive designs but not the best made pieces of felt in the world. It isn’t always possible to talk to people and concentrate on laying an even layer of wool at the same time! 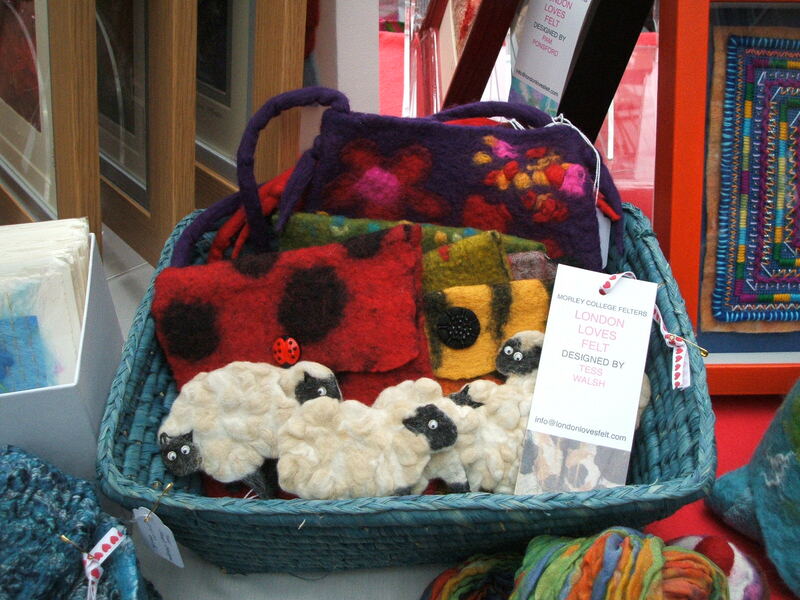 I am thinking about having a basket of them on the stall explaining their provenance, and suggesting that people who want to give them a good home make me an offer…..People also seem to like the sample pieces I put with my photos and I have sold several of them. 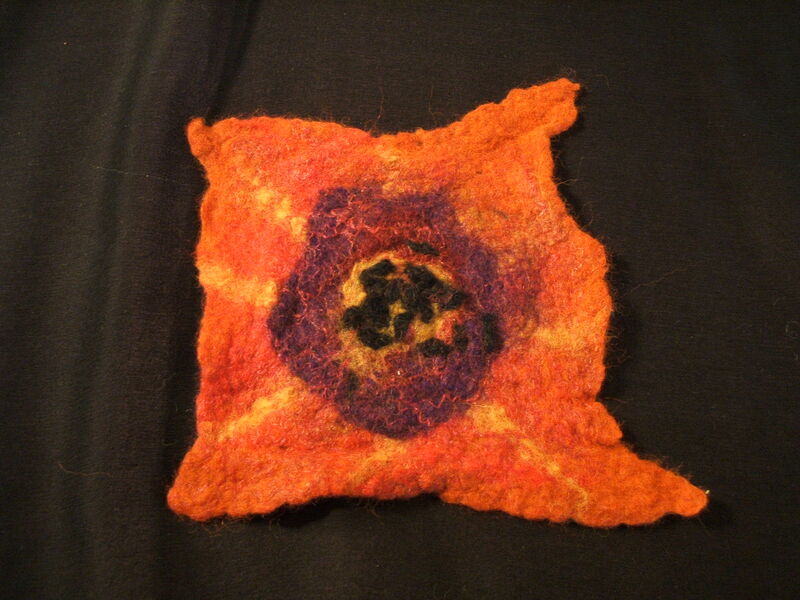 I made a couple yesterday which I liked so maybe this is a good way to go with demonstrating……. I also got a chance to try out the two scarves I have made on the public. They had some interest but it seems that I need to work on getting the size right. 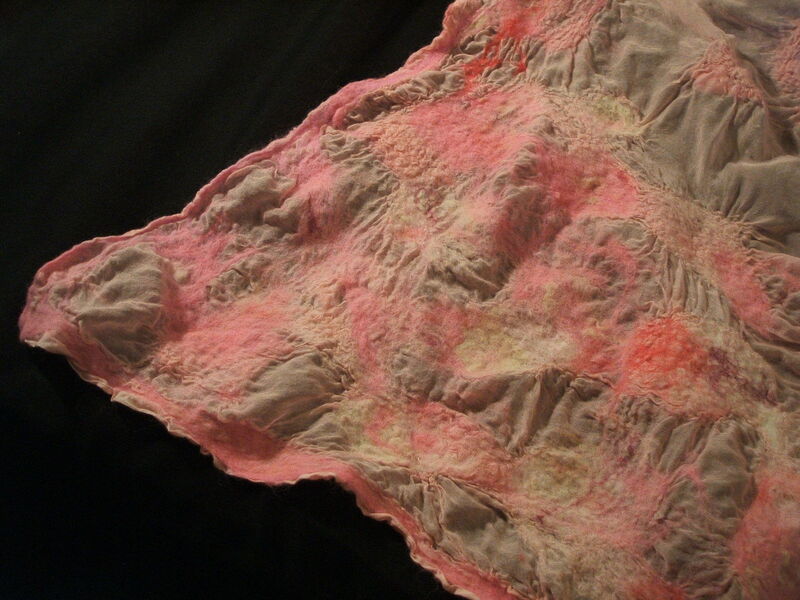 This pink one is very pretty but maybe too short to be worn wrapped round the neck. 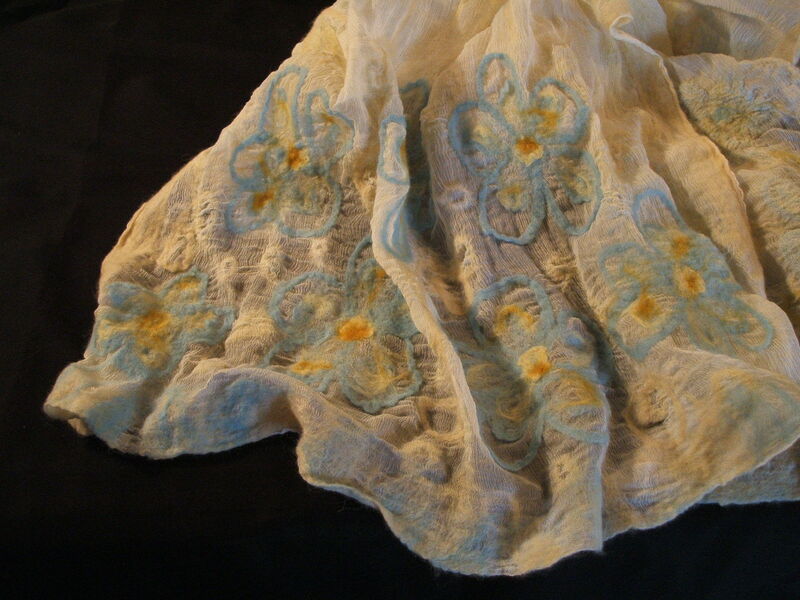 The cream one is much longer but more like a stole / wrap than a scarf. Its all in the proportions……Looking on Etsy it seems that makers are mostly seeling scarves that are at least a metre and a half long, but often thinner than mine. Hi there to anyone reading this. I think -fingers crossed- that I have just added a link to my new Etsy Shop on my sidebar. Golly – all this techie stuff is a bit complicated! 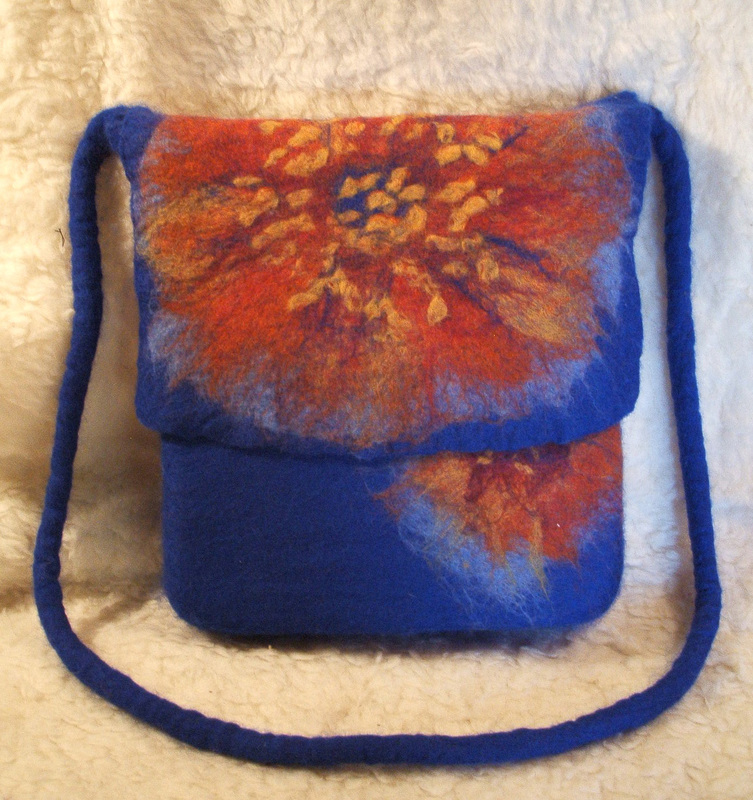 Here is a picture of the bag I finished this morning just to add something pretty to the post….its not even quite dry yet but I am pleased with it. For some reason this cobalt blue wool seems to make a particularly smooth felt – different colours of wool really do seem to have different characters….! 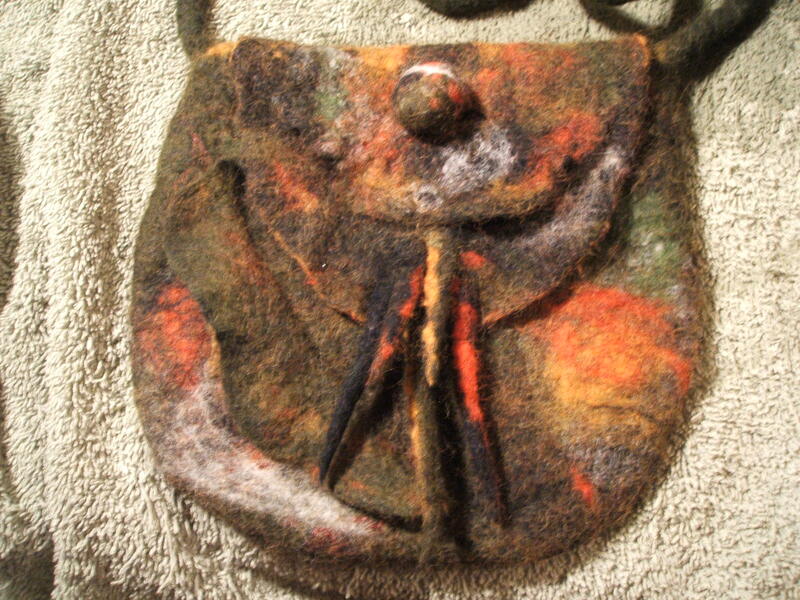 The orange decoration is made with a prefelt that I attached before fulling the bag.